Psychologists suggest that our childhoods help shape the people we become as adults. I grew up in an overwhelmingly rural, white town. The school district was highly rated. My educational experience lacked seriously in one important way though: diversity. In the 2000 Census, Scituate, Rhode Island reported that only 30 African Americans living there — compared to the 10,131 white residents. I’d like to present some data. The Rhode Island Department of Education (RIDE) keeps a plethora of data on all students registered and attending high school in the state. It is publicly available to anyone online. 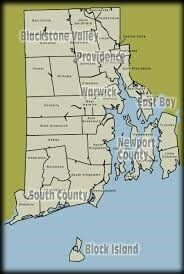 I grew up in Scituate, Rhode Island. My mother now lives in Providence, Rhode Island near Mount Pleasant High School, so I will use these as sample school systems for analysis. According to Google Maps, these schools are approximately 12 miles apart. Yet, the student demographics could not be more different. According to RIDE, in the 2016-2017 school year students at Scituate High School were 96 percent white, two percent Asian, and one percent African American. For the same year, Mount Pleasant students were 68 percent Hispanic, 16 percent African American and eight percent white. Mount Pleasant had roughly double the number of students as Scituate at 882 students to 447 students, respectively. Besides the demographic differences, Table 1. represents the great disparities between student outcomes at Scituate and Mount Pleasant High School. 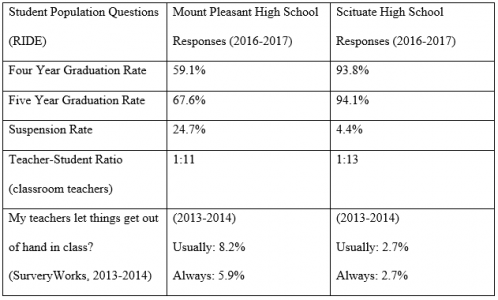 While the student population is almost double than that of Scituate, the graduation rate is dismally lower at Mount Pleasant. Yet, the classroom, teacher-student ratio at Mount Pleasant shows more teachers per student than at Scituate. More importantly, the suspension rate at Mount Pleasant is more than six times that of the rate at Scituate. 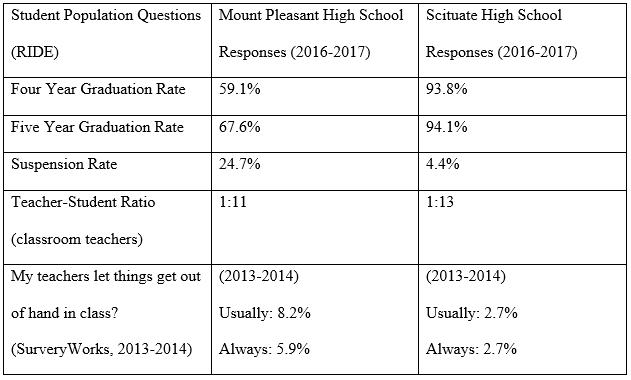 Furthermore, while there are more classroom teachers to students, students at Mount Pleasant report teachers losing control of the classroom at much higher rates than Scituate. Many of these statistics are not surprising. They have been reported similarly in states around the country. The general stereotype is that urban schools underperform compared to suburban schools and that kids don’t graduate. With data like that of Table 1, some European Americans are given faith in these stereotypes. They interpret the data as reinforcement for moving out of urban areas and educating their children only with other children that look similar. What the RIDE data undoubtedly proves, however, is that teacher bias exists. It is a visible factor, influencing the type of education Rhode Island children receive. A recent report published by the New York Times states that, “even when African-American families do manage to rise to affluence, their boys can’t stay there because of systemic racism.” The data I’ve presented reinforces these findings. In a district like Providence, and a school like Mount Pleasant, students of color are more likely to have greater teacher supervision, be punished more frequently and be given up on by teachers before they graduate. Family socio-economic status also plays a significant role in our childhoods and the type of adults we become, generally due to access and availability of resources. Although acknowledgement is due, the tendency to omit ethnic background as another factor is too common. Euro-Americans need to acknowledge the privilege that’s been bestowed upon them. We also need to acknowledge our own sub-conscious racial biases. As of 2013, less than five percent of Rhode Island teachers were people of color. We live in an era of re-segregation, where white supremacists are marching openly for their beliefs. Any argument to dismiss racial bias in our country is, at best, unacceptable. Growing up in majority white town shaped my worldview and left me with a lot of questions regarding people of color. The only people of color I knew before adulthood were on television or in the music I listened to. There are thousands of other European Americans that grew up just like me, with only stereotypical imagery to guide their understanding of diversity. When we go out into the workforce as adults, there is no question that this affects us, both consciously and sub-consciously. It is not a positive thing and it is bad for our country too. What I want is for other white people to admit this and to acknowledge it as a flaw. Stereotypes favor my appearance and mostly I benefit from white privilege rather than am challenged by it. There, I said it.